This image, taken on April 7, 1993, shows me using the world's first portable virtual environment system, by Future Vision Technologies. While the first prototypes were developed in 1991, this version was the first to be strapped on to the user's body and powered by a battery lifted from a Macintosh Powerbook. Although never brought to market by Future Vision, this unit is remarkably similar in design to Nintendo's VirtualBoy which was released years later. The failure of VirtualBoy to sell many units gives me a sense of comfort that I never saw this unit as being well suited for gaming. 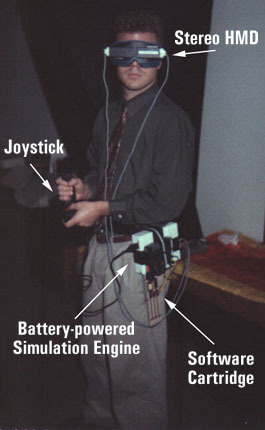 Some of my application concepts were described in the SPIE 94 paper Portable Virtual Environment Generator: InterFACE and in the VR Report, May 93 article Wearable Virtual Reality and Network Management. The user plugged a ROM cartridge with the desired software, put on the HMD, grabbed the joystick and powered on the unit to see a red-wireframe world snap into view. The HMD used two PrivateEye displays from Reflection Technologies to generate a stereoscopic CGA-resolution display with extremely high contrast and brightness. Since most of Future Vision's effort was focused on other products, only one title was ever created for this unit. The monotony of demonstrating this single title over and over again led to nightmares of being trapped in "Hell City." Needless to say, the name stuck, and to this day early VR mavens will still conjure the name in conversation with the slightest hint of red reflecting off their retinas. The images below are from a camera pointed into one of the eyes. The blur is from the camera catching the display in mid-scan. The user saw the scene as rock-solid and very bright. These photos serve as a reminder. There was so much good technology being developed back in the early 90s. We all had the bug and we had it bad. Innovation was occurring at a rapid pace, so rapid that we thought that these crappy interfaces you are using right now to read this article would be long gone. The question is, what happened? I certainly didn't think computing at the millennium would look like this. Well, I certainly hope to bring the promise back to life.